Andesson, who recently ruined 21 this past May, is the son of former Rangers defenseman Peter Andersson. He’s coming off a fantastic season with Lugano as one of their youngest defensemen, totaling 17 points (5-12-17) in 30 games, and adding another three in six playoff games. He comes from a good hockey family, with his father suiting up for both the Rangers and the Panthers, and later teaching his son at Lugano as the team’s assistant coach. 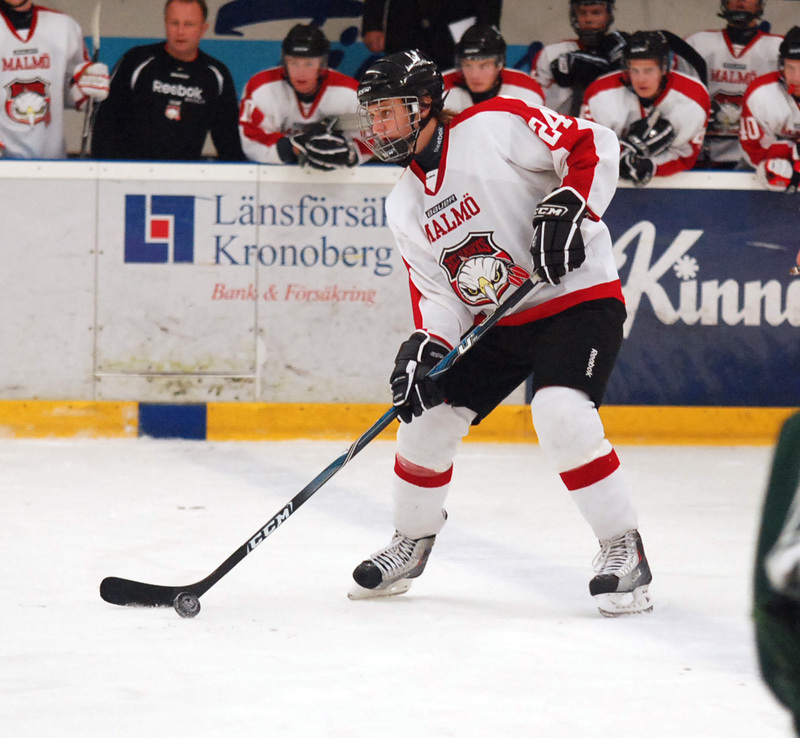 Andersson was profiled as a good two-way defenseman, contributing both on offense and defense. He’s also got size, standing at 6’2” and weighing in at 212 pounds. He skates well for a big player, positions himself well to make plays, and passes well. He’s not a flashy player, but he makes smart decisions, and acts as a leader and commander on the ice. The fourth round draft pick in the 2012 draft is expected to play next year on a two way deal. He may see some action in the NHL in brief stints in case of injury, but he will likely spend most of the season, if not all, with Hartford. He seems like a solid prospect, and right-hand shots are always welcomed on the Rangers’ blue line. He’ll be fun to watch in Hartford. Posted on July 29, 2015, in Rangers Updates and tagged Calle Andersson, Hartford Hockey, Hartford Wolf Pack, New York Rangers, New York Rangers blog, NY Rangers, NYR, Rangers, Rangers blog, Rangers prospect report, Rangers prospect watch, Rangers prospects, Swiss Hockey League, Wolf Pack. Bookmark the permalink. 2 Comments. – Mcilrath on a make or break 1-way contract. – Rafael Diaz. Probable #7. – Petr Zamorsky coming to Hartford from Europe. High hopes for him! He may be the righty to make our bottom pair on the right side in 2016-17. I am really, really rooting for this guy. Keep an eye on him! – Troy Donnay & Sam Noreau will be given shots at Hartford, but are probably long shots to ever make the NHL. At least they’re fresh blood for the Wolfpack.